Please stay home if you want to vote for Trump... For the love of God and this Country. Apparently the people in my hometown, the (only half-heartedly) People's Republic of Arlington, listened to the whole voting thing (I think a lot of Democrats crossed the line to have the chance to vote against Trump), but not enough people are listening. 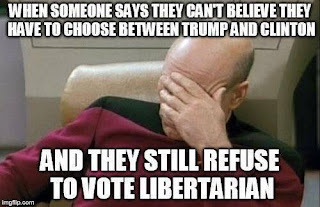 I am voting for the Libertarian candidate if the Republican's cannot figure out a way to not nominate Trump (I admit to mocking the Democrat's "super-delegate" concept for being undemocratic (part of the reason that no one really expected Bernie to get nominated, when you are as plugged in and part of the system as Hillary is, that is a heck of a windmill to tilt to challenge her), but it is looking like a good idea now....). 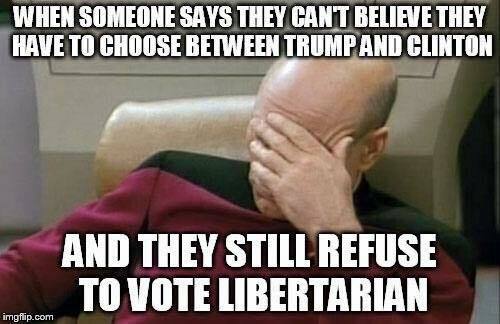 I just... can't..... vote for Trump or Hillary.